Improving the sound and tone of your instrument. One of the most popular as well as cost efficient way to immediately improve the sound and tone or your instrument is nut and/or saddle replacement. Every instrument is basically a vessel to transfer energy via sound waves. Anything that takes away from the energy transfer results in a reduction of tone, volume and sustain. 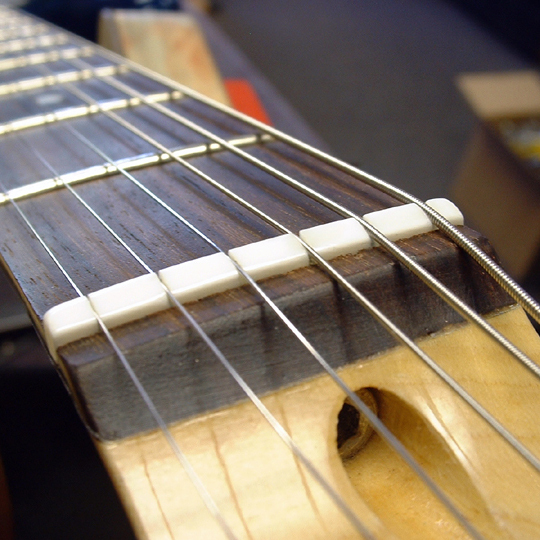 The nut and saddle act as a transfer point between your strings and the wood, making them very important in the overall quality of your guitars performance. However most guitar companies still install a soft generic fitting, plastic material. In the case of electric instruments, not all chrome platted material is of equal quality. This essentially takes away from the energy transfer. By upgrading to a much denser, more consistent material, hand made to fit each unique instrument, we are able to enhance the transfer of energy. This gives you an instrument that will sound better, sustain longer, with an improved ability to project. This upgrade in conjunction with a set up will most often make the biggest difference. Often no more upgrade/mod work is needed to keep the love affair with your guitar alive for many many years.